Our latest Simply Creative decoupage paper designs feature dragons, unicorns, robots, rainbows and more, perfect for a kids craft project! Read on to find out how they can use these imaginative designs in a few easy steps! 1. Firstly find a tin that has no sharp edges that is also clean and ready to use. Paint the outside of the tin with a coat of DecoArt Chalky Paint- Everlasting with the soft, nylon brush from the First Edition brush set. Leave to dry. 2. Measure the width of your tin and cut a strip of the Simply Creative Unicorn Decoupage paper to fit around the tin. 3. Paint a layer of First Edition Deco Mache Gloss Adhesive and Varnish to your tin with a clean, nylon brush. Carefully begin to wrap the piece of unicorn decoupage paper around the tin starting from one edge of your decoupage paper. 4. Once your design is wrapped around the entire tin, carefully cut the excess paper off. 5. Add a layer of First Edition Decoupage glue on top of your decoupage design with the nylon brush as this will help you get a smooth and varnished finish on your design. Leave your tin to dry. 6. With glue, add a selection of Dovecraft Bohemian silver, pink and purple sequins to your tin. 7. 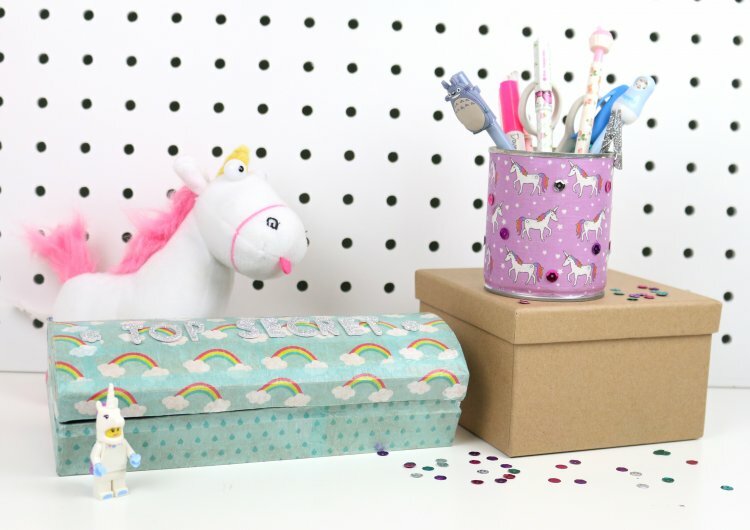 Create a pattern around your tin with your sequins to add a little glitz to coordinate with your unicorn design. This is a great tutorial for the kids to hold their favourite pens and pencils! Alternatively, they could decoupage a box with a fun design to look after their little knick knacks. Now their favourite small toys will be safe inside a fun and creative box they have designed! To finish, they could add a fun title to their box like ‘Top Secret’ using the Simply Creative Alphabet and Number glitter stickers. We are such a fan of a kids craft project and if they’ve been inspired by this tutorial we would love to see so remember to upload their wonderful makes to the project gallery and to #Trimcraft when uploading on social media. Have you read our 1 die 3 ways tutorial? We show you how to use the new Dovecraft feather die in 3 unique ways!